The DISP and CODIS products are solvent-free (co)-Dispersants for pigments and fillers which are used primarily in coatings, inks and adhesives. CODIS BIO provides very effective pH control for low odour systems . It has no contribution to VOC/SVOC and is >75% based on renewable resources..
ADDAPT-SPERSE PH provides very effective pH control for low odour systems. It has minimal contribution to VOC. ADDAPT-SPERSE PH contains a proprietary blend of Alkanol-amines in water. Our new range of Wetting & Dispersing additives "ADDISP" will soon be available! 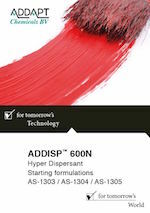 DISP 600 is an excellent solvent-free Dispersant for (mineral) pigments and fillers. It is also excellently suitable for colorants and reactive pigments. DISP 800 and DISP 900 are excellent solvent-free Dispersants for (mineral) pigments and fillers. They enable a high pigment loading at low viscosity. Ester 20 DA is a solvent free pigment dispersing agent for solvent based systems. It is especially recommended as disperging agent for Carbon Black.